Recycling Works: Can I Recycle Pringles Cans? Second only to Lay’s with Ruffles nipping at its heals, Pringles’ 2017 sales hit a whopping $549.7 million. Pringles, which have been around for about 4 decades are sold in over 140 countries and don’t show any signs of slowing down in popularity or sales. “While there are about 29 flavors of the snack on shelves here in the United States not counting special and limited edition runs, the rest of the world has tasted an entirely different spectrum of Pringles. A few that have sounded interesting are Bangkok Grilled Chicken Wing, Blueberry & Hazelnut, Finger Lickin' Braised Pork and Mayo Potato.” Some that are maybe better suited for other countries are seaweed (which are, of course green), grilled shrimp (coming out of the can a light pink) and soft-shell crab. Since Pringles cans are not recyclable, the best way to handle the packaging of one of the most popular snacks is to reuse or upcycle them. Below are some ideas for what to do with these iconic cylindrical cans. "Decorate the outside of the can with construction paper, glitter, ribbons, or whatever you like, then fill it with homemade cookies, and give it away as a gift. Or skip the decorating part and just use the container to hold cookies on your next camping trip! Use Pringles cans to hold odd- or small-sized gifts. Just stuff the can with tissue paper or cellophane, add the gift, and cover the outside with wrapping paper. Use a Pringles can to store your artist paintbrushes. For bigger paint projects, store your used roller inside a Pringles can to keep it from drying out between uses. Just cap it and place it in the fridge. Decorate the outside of a can, poke holes through the sides, attach a string for a handle, and have your son or daughter use it for transporting their papers home at the end of the week. Use Pringles cans to store small toys or tennis balls. Use them to store dry pastas of any kind. Keep one on your desk for organizing pens and pencils. Keep your knitting and crochet needles inside Pringles cans. Yarn can also be kept from unwinding if stored inside a Pringles can. Use one to store an open sleeve of crackers (like Ritz or Club) to keep them from going stale. Use one as a disposal for your diabetic testing strips and lancets. Wind your Christmas lights around them to prevent tangling and for easier storage. Use the lid as a spoon rest when you're cooking. Fill the can with dry dog food when you're camping or on a weekend trip (depending on the size of your dog, of course). Cut a slit in the lid and use the can to collect coins. Turn the can into a kaleidoscope by following the instructions at MakingFriends.com. Use a Pringles can and the heat of the sun to cook hot dogs! Just follow the instructions at SolarDIYHQ.com. Decorate the outside of a Pringles can and keep it on your kitchen counter to store utensils. Wrap white paper around a Pringles can, paint a red cross on it, and fill it with medical supplies like bandages, ointments, antiseptics, and painkillers for an at-home first-aid kit. 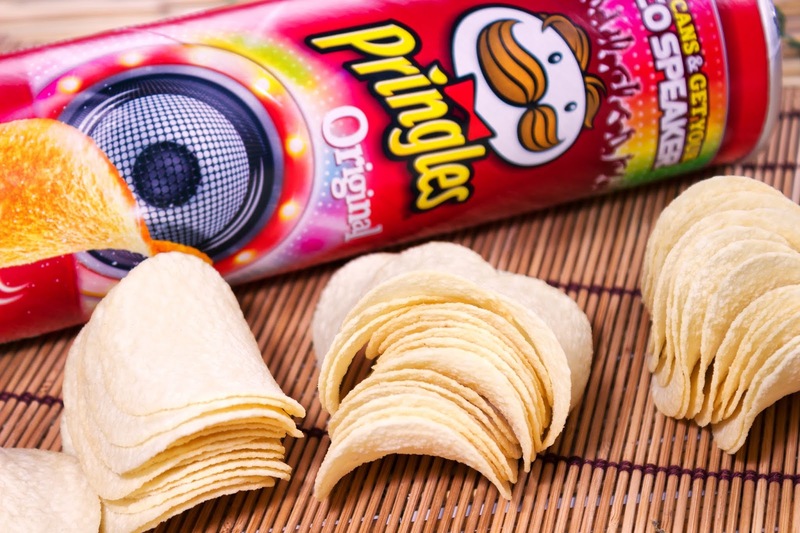 Teach your students or children about rhythm, or just good, old-fashioned noise-making by turning Pringles cans into maracas. Just fill the cans with dried macaroni, beans, rice grains, or beads. Turn a Pringles can into a pinhole camera! Just follow the instructions at Exploratorium.edu. Regardless of what treasure you find to make out of a Pringles can when you are done eating the second most popular chip sold, consider reusing them before landfilling them.